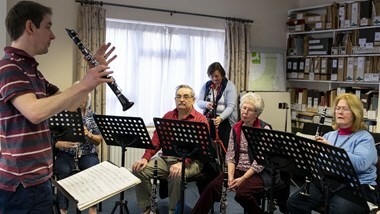 Clarinettists David Campbell, Margaret Archibald and Ian Scott return for a special clarinet celebration of Benslow Music's 90th anniversary, joined once again by pianist John Flinders. The Saturday afternoon masterclass with David and John will give course members a platform to share performances of a movement from Mozart's Concerto in A K622 or Horovitz's Sonatina; the parallel performance workshop with Margaret and Ian will offer less confident performers the chance to study Tartini-Jacob's Concertino or a movement from Finzi's Bagatelles in open forum. Clarinet choir sessions will focus on one work for which scanned practice parts will be sent in advance. Small groups will be formed with some advance planning of repertoire to enable players to prepare. John Flinders will see every course member for a short rehearsal of a piece with piano accompaniment; players are invited to suggest works. Course members will share cars in order to offer the final informal concert on Sunday afternoon to an audience at Symonds House Leonard Cheshire Disability in Hitchin. The course will finish at approximately 5pm. The tutors' public recital on the Saturday, for which all participants receive entry as part of the course fee, will be a celebration of clarinet repertoire for duo, trio and works with piano.